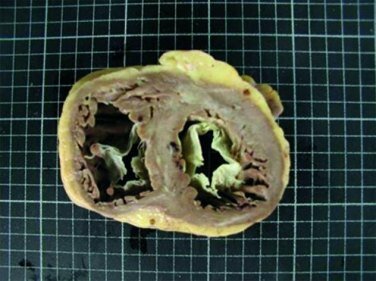 Restrictive cardiomyopathy is a heart disease characterized by impaired ventricular filling in the absence of myocardial hypertrophy or significant impairment of systolic function. Patients usually present signs and symptoms of heart failure with increased mortality rate, requiring heart transplantation in many cases. Although many of the genes associated with this disease are associated with other types of cardiomyopathies (particularly hypertrophic and dilated), there are some predominantly related to this phenotype. It is able to identify the causative mutation, confirming the diagnosis of the disease. Due to the clinical heterogeneity and overlapping of different phenotypes, it is very important for differential diagnosis. When a pathogenic mutation is detected, it can be used as a predictive test. It is useful in genetic counselling, since it can detect carriers at risk that should be under adequate clinical monitoring. The probability of identifying a likely causative mutation in a patient under suspicion of restrictive cardiomyopathy is approximately 50%. The diagnostic yield is higher in cases with a clear phenotype and family history of the disease. This panel is indicated as a first diagnostic approach to a patient with a clear phenotype of restrictive cardiomyopathy, as it has been designed specifically for this condition. It includes priority genes, which are genes that have been clearly associated with the disease. Some of them are also associated with other cardiomyopathies. Genes that have been sporadically associated with the disease are listed as secondary genes, and candidate genes gathered from a systematic literature review are also included. Priority Genes: These genes include >70% of the mutations that have been previously associated with the development of restrictive cardiomyopathy and/or their testing is recommended by the guidelines. Secondary genes: Other genes related to the disease. *Candidate genes: Without evidence, but likely to be related to the phenotype.